img height="1" width="1" style="display:none" src="https://www.facebook.com/tr?id=764581353877547&ev=PageView&noscript=1"
Craig started his entrepreneurial journey as he entered his teens. With one thwarted business adventure after the other, he ploughed his way through school making money from one crazy idea to the next. Watch the following video to learn more about Craig’s story. Craig’s dreams were there from an early age, but what he lacked then was a plan and the know-how to succeed. His dreams of driving Porches and travelling the world were cemented in his mind, but upon leaving school, his income was the level of a second hand Golf at best, with limited income to afford trips abroad. One of his early influences was his mother Jackie; a vibrant, passionate woman who herself has transformed from someone quiet, to an impressive leader in her field. A motivator, a true coach and an exemplary example to her children. His father, Peter, also an entrepreneurial character, that turned his hand to many, many things in his bid for a successful life. What unites them all, is their Passion to Succeed, their passion to live fuller lives, beyond what most only dream about. So, how did Craig make that jump from average child, to successful entrepreneur? He listened. He learned. He embarked on a journey of personal development. A journey that he is still on now, a journey that he wants to now share with others. So far, his journey has lasted 17 years, and the path ahead never ends. He’s a true believer in many philosophies, ‘the more you sow the more you reap’, ‘be the creator of your own destiny’ ‘never be average’. Through his journey of learning, his self-belief has grown immeasurably and his appetite to acquire knowledge, skills and strategies to succeed is endless. He has successfully built multiple income streams to sustain the life he now leads. This life isn’t just about money, it is about something more precious to Craig; freedom. The freedom to live the life he chooses, with the people he loves. The knowledge he has gained, the passion he possesses to push further, he shares with all he comes into contact with. He’s a true ‘sharer’ of his knowledge. He keeps no secrets of what it takes to be successful. He contributes greatly to the development of others, in their quest for a better future. Inspired by the quote from Zig Ziglar ‘You can get everything in life you want if you will just help enough other people get what they want’ Craig lives and breathes this philosophy. Craig also helps others identify the key elements that are holding them back in their life and helps them crystalise the action they need to take to move forward; we are all our own worst enemies when it comes to change. He helps people re-programme their beliefs into one of a success-culture. These techniques are ones the shares daily with the most precious people in his life, his two daughters. He teaches them to avoid placing limits on their life, and to develop the belief in themselves that they can achieve whatever they set their mind to. Although still only primary school age, they are both tri-lingual, and have goals and adventure lists that they plough their way through. By speaking only positively to them, Craig believes this will enable them to achieve greatness that evades the masses. He simply avoids allowing self-limiting vocabulary into their lives. Whilst as adults, we may take a little time to re-programme, with Craig it is possible if you just enjoy the journey, and believe anything is possible. So, what lays ahead for Craig in the future? He’s focussed on building his business, to enable him to not only touch the lives of his own children, but to be able to reach out to others and establish himself a philanthropist. Here, Craig delivers a message to over 3,000 entrepreneurs, that if you are passionate about something you can become excellent at it. Craig’s humour, inspiration and dedication was to guide these 3,500+ attendees to discover their trigger point and be the catalyst for change. A day at the famous Cheltenham Race Course. Over 2,500 attendees are inspired by Craig’s story, leadership and strategies for success. We often hear ‘Repetition is The Mother of all Learning’- for me this consistent and never-ending improvement is often cemented in my mind through conversation; sizzling with fellow entrepreneurs after an event discussing what we have learnt, having a one to one with the author, the mentor, the coach. I am 100% certain conversations develop trust, belief and relationships that enable you to really hear and feel the message we read and listen to. 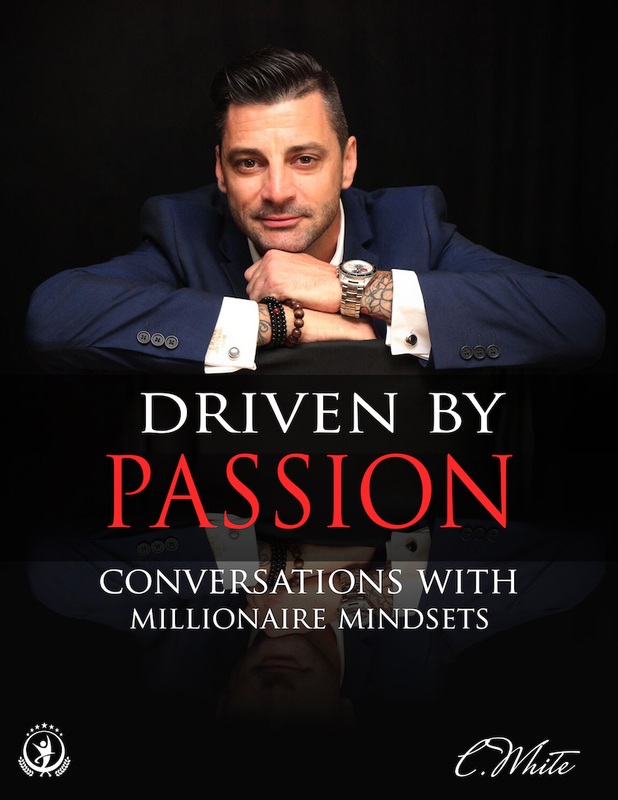 With this in mind, Driven By passion will give you an insight into 15 conversations with people with millionaire mindsets from all over the globe. Through the conversation transcripts you will discover the secrets of implementing the 7 habits of passionate entrepreneurs, and how they have and continue to turn their passions into profit. This can be YOUR blueprint for immediate and future success! Download your free copy of Driven By Passion here! If you’re looking to develop a millionaire mindset and transform your life, get in touch with us for a free consultation. Alternatively, to book Craig to speak at your event, please send us a message using the following form.